6. What if the weather stops or prevents the fireworks display? Could be as simple as postponing until weather permits, rescheduling, Or canceling w﻿ith a restocking fee. 7. Who organizes the license or permit for our fireworks display? Your local fire department is the authority having jurisdiction (AHJ), over all fireworks displays. Along with our site plan, a list of fireworks we plan to use, and proof of insurance, we will submit an application for the permit. 8. What’s the difference between a Pyrotechnic Display vs Fireworks Display? A pyrotechnic display involves the use of close proximity or " stage" fireworks. 1. What is minimum budget cost for a Wedding Fireworks Display? 2. What does it include e.g. cost of the permit? 3. Will our Wedding Fireworks be customized? 4. How much space is needed for our Fireworks Display? It depends on the maximum caliber of shell that is shot in the display. 5. What special effects can you add for Weddings Pyrotechnics displays? Heart shells and a custom "set piece" with names of the bride and groom. 6. How long does it take to Plan or Reserve for our Wedding Fireworks Display? To allow adequate time to prepare your show, allow three to four weeks. 1. Is there an age requirement to be a Pyrotechnician? 3. What kind of training is required? You must have worked on a number of fireworks shows as an assistant pyrotechnician and attend a formal training course. 4. 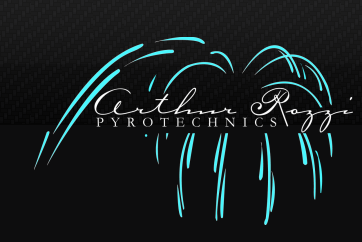 Does Arthur Rozzi Pyrotechnics provide pyrotechnic training?